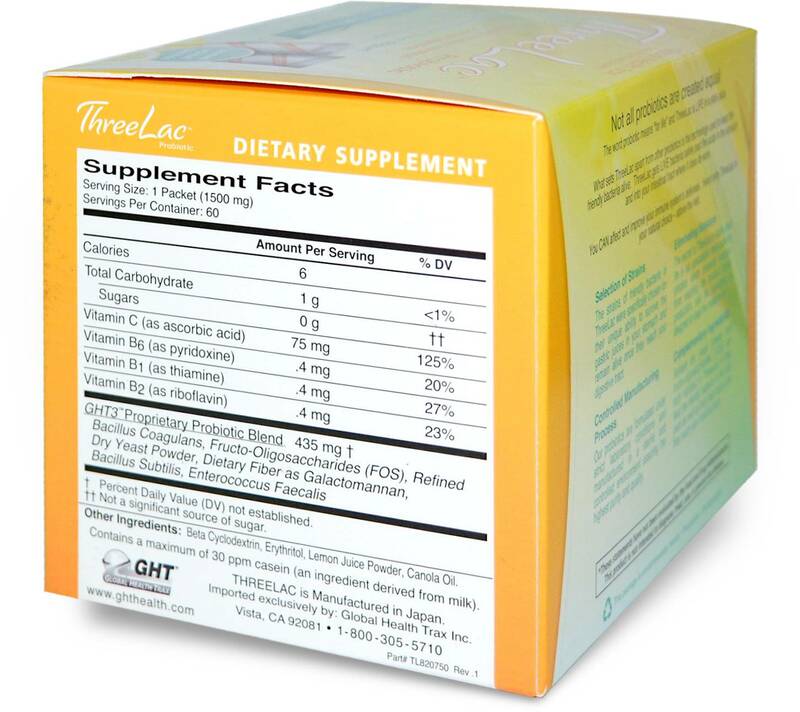 Candida Yeast Support is a combination of three active probiotics and the nutrients needed for their survival, along with vitamins designed to combat health imbalances caused by Candida Yeast. 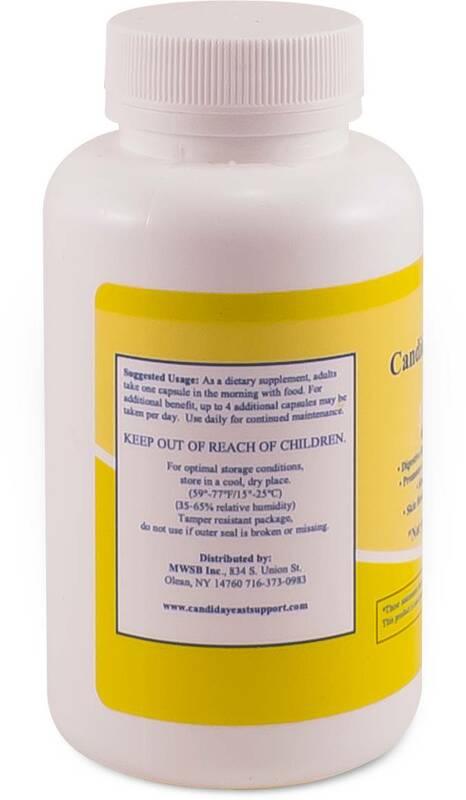 Candida Yeast Support is a product that is made up of live bacteria. And this live bacteria is put into a deep sleep by dry freezing it very quickly. It is then put into capsules. As you swallow the capsules they travel of course down your throat, into your stomach and then into your intestinal tract where the live bacteria “wakes-up” to go about looking for “bad guys” and bringing them under control. OK what part of the body does the product “Candida Yeast Support” affect? While it seems to affect all parts of the body it actually goes to work in the intestinal tract both in the large and small intestines. 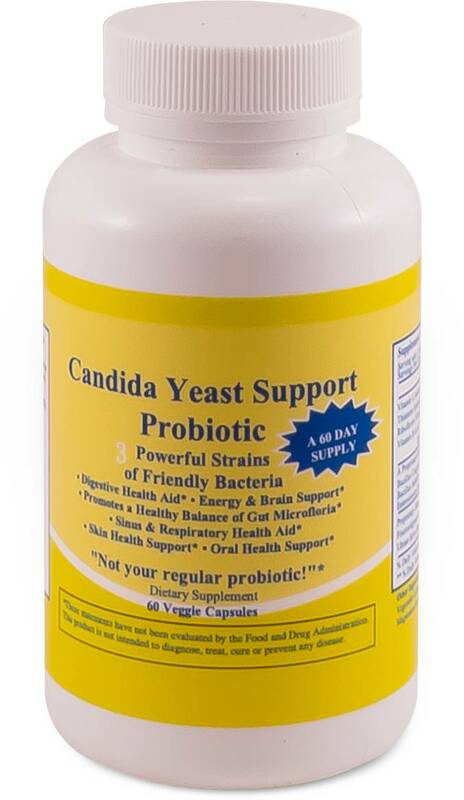 Candida Yeast Support is a product that is made up of live bacteria. And this live bacteria is put into a deep sleep by dry freezing it very quickly. It is then put into capsules. As swallow the capsules they travel of course down your throat, into your stomach and then into your intestinal tract where the live bacteria “wakes-up” to go about looking for “bad guys” and bringing them under control. Bad guys? What do you mean by that? Bad fungus, “candida” or “candida yeast” or “candida albicans” or just simply “yeast”. You’re taking live bacteria? I thought all bacteria were bad? Not true. This is a big, big misconception. Not all bacteria are bad. Our intestinal tract is chock-full of bacteria. Can you believe over 400 different strains consist of trillions of these little plants? The fact is we need bacteria in our intestinal tract in order to live. Without these bacteria we would soon perish. Without bacteria we would die? Are you serious? Dead serious. You see not only do these live bacteria help us breakdown and digest our food they help us evacuate waste out of our bodies. Like I said without them we would soon die. So where does this candida yeast fungus come into play? We have many areas of our body that contain fungus like the mouth, vaginal area in women and the intestinal tract. A certain amount of candida yeast is helpful, too much is a problem. So let me get this straight, fungus within our intestinal tracts can become a problem? That’s precisely what seems to happen. Why is it the yeast fungus or candida yeast fungus seems to grow out of control? Actually there are other types that can grow out of control also but due to many variables the yeast family seems very susceptible to it. What sort of variables are you talking about? A diet heavy in refined carbohydrates. So how do refined carbohydrates cause a yeast overgrowth? Easy, yeast seems to like the “taste” of refined carbs. And consequently it can cause the yeast to grow out of control. The fact is the average person eats more than 100 pounds of sugar per year. Yeast seems to love sugar; it’s as simple as that. What about antibiotics? I thought antibiotics were good for us? They are to a point but the fact is that doctors now prescribe antibiotics like they were prescribing candy, everyone gets antibiotics if they need them or not. Obviously for many thing antibiotics are needed and important. You remember the old physics law that states that for every action there is an equal reaction. In other words doing one thing quite often produces results that may not always be seen or understood. It’s this way with antibiotics. They are meant to kill unfriendly bacteria or infections that reside in the body. However antibiotics are indiscriminant “killers”. They can kill both good and bad bacteria. And if wholesale killing of good bacteria happens in the intestinal tract then families of fungus that are normally held in check by good bacteria can be suddenly “turned free” to reproduce at an explosive rate. Yeast or candida yeast seem to be one of those that will expand rapidly if antibiotics cause the death of too many good bacteria. Check the directions of any antibiotic; diarrhea is a pretty common malady that is associated with antibiotic use. You know what’s happening don’t you? The bacteria in your intestinal tract are thrown out of whack due to the antibiotics, which causes your waste evacuation system to go haywire. But an even more serious problem is the potential for causing fungus to grow out of control contributing too many issues throughout the body. What is this term “Candida”? Candida is often just another term used to describe yeast fungus. Quite often when someone says they have a “candida problem” what they are really saying is that they have a yeast overgrowth problem. It is also referred to as “Candida Albicans” or a “Candida Yeast” overgrowth. So if I hear someone say they have a “candida” problem they mean they have a yeast overgrowth problem? But what if they say they have a “systemic candida problem”? What this means in some circles is that the candida yeast have gotten in the blood stream and are causing issues throughout the body. You sound uncertain about this? The “epidemic of the 21st century”? That sounds pretty intense? It is. And when you see the vast number of issues that seem to be tied to a potential candida yeast overgrowth you’ll see why many people believe that upwards of 80% of all Americans suffer from one extent or another due to this issue. That’s a heck of a list! You mean all these issues are tied to a candida yeast overgrowth? All the time? No. But over the last decade it has been found that by controlling the overgrowth of candida yeast in the intestinal tract that many of these issues are lessened, many times the issues have disappeared totally. It appears that even those in the orthodox medical community are slowly coming around to the idea that having too much yeast or candida yeast in the intestinal tract can result in many undesirable issues. So how can an overgrowth of candida yeast in your intestinal tract lead to these other various issues? Good question. There seems to be a couple schools of thought. #1. It appears that many times a candida yeast overgrowth can contribute to a weakening of the immune system. And as the immune system weakens it allows some of these other issues to overtake the body. #2. As the candida yeast “eat” they expel toxins that flow throughout the body contributing to bad issues. #3. Candida yeast can infiltrate the blood stream contributing to issues. But that being said it seems from dealing with literally thousands of people that if the candida yeast overgrowth in the intestinal tract is brought under control that many of these issues cease to become issues. Is this a problem that affects men and women equally? Absolutely! Obviously woman will suffer vaginal yeast infections and men won’t but men seem to make it up with digestive problems, jock itch, oral thrush, fatigue and clouded thinking. Are there any age specifics with this problem? No, babies can get diaper rash (which many believe is a candida yeast problem) to oral thrush to digestive problem. How would babies get a candida yeast overgrowth? One school of thought is that they can get it by coming in contact with the candida yeast within the vaginal canal during childbirth. Others believe it is passed through the blood and others believe that it is passed due to breast-feeding. What sort of digestive problems are associated with a candida yeast overgrowth? Constipation, diarrhea, gas, bloating are all typical signs of a candida yeast problem. It also seems that acid reflux and heartburn could also be connected. IBS (irritable bowel syndrome) is another issue that seems to have some connection to a candida yeast problem. Food allergies are connected to a candida yeast problem? They seem to be and it makes sense. If you don’t have the right amount of bacteria in your intestinal tract then you can’t process certain foods and thus you can become allergic. How long can a person suffer with a candida yeast problem? In many cases people have suffered for decades without properly addressing or even understanding that they have a candida yeast problem. The biggest problem in dealing with a candida yeast overgrowth is recognizing that you have a problem. Again if you are working with a doctor that doesn’t understand the importance of proper bacteria health within your intestinal tract you’re not likely to get the right help. Heck many times people are prescribed antibiotics, which can make the problem even worse. Is there any sort of test someone can take to tell if they have a candida yeast problem? Yes, there is special test called the “Spit Test” and you do it like this, First thing in the morning, before you put ANYTHING in your mouth, get a clear glass. Fill with water and work up a bit of saliva, then spit it into the glass of water. Check the water in about 30 to 45 minutes. If you have a potential problem you will see strings (like legs) traveling down into the water from the saliva floating on the top, or “cloudy” saliva will sink to the bottom of the glass, or cloudy specks will seem to be suspended in the water. If there are no strings and the saliva is still floating after one hour, you probably have normal levels of yeast under control. Is the “Spit Test” accurate? Even though it may sound “hokey” after having thousands of people take the test it does seem to be relevant. Any other tests out there? Yes, measuring your pH can give some indication if you have a candida yeast problem. Someone that is more acid (less than 7.0) is quite often found to be at a higher risk for a candida yeast overgrowth. You mention antibiotics as something a doctor may prescribe for an issue tied to candida yeast, what else might they suggest, and is it effective? Great question. Many times a doctor will prescribe some sort of anti-fungal product for a candida yeast overgrowth. The problem is that like when taking antibiotics, an anti-fungal can do more long-term harm than it does short-term good. Not to mention the warning labels for many anti-fungals suggest that long-term use could result in damage to internal organs like the liver and kidneys. Are there any other problems with taking anti-fungals? Yes, it seems (as reported by many people) that a specific anti-fungal only seems to work for a limited time. The candida yeast seems to “mutate” rendering the anti-fungal ineffective. Then you are forced to take another type of anti-fungal. Anti-fungals do not seem to be a good solution? Many experts along with the people that have taken the anti-fungals would support that view. There are better solutions that seem to be much safer and not damaging to your other organs, but the best thing is that the candida yeast doesn’t seem to be able to “mutate” against his other solution either so it always seems to be effective. Isn’t oil of oregano and coconut oil considered “natural” antifungals? In your experience what have you found to be the best solution for a candida yeast problem? The best solution we’ve found (and we’ve dealt with thousands of people) is a very special type of probiotic like “Candida Yeast Support” that seems to be very aggressive towards candida yeast. A special type of probiotic? What is a “probiotic”? A probiotic is the name given to the live bacteria that are ingested via a capsule, powder or some other method. There are literally hundreds of different types of probiotics on the market today. Some cost as little as a few dollars and some in the hundreds of dollars. Like I said earlier there are hundreds of different types of bacteria in your intestinal tract and literally thousands more that exist on the planet. Some bacteria do one thing and some do another. Consequently the cost to grow and package one type of bacteria can be far different than the cost to grow and package another. So not all probiotics are the same? So will just any probiotic help with a candida yeast overgrowth? A person can get a little relief (sometimes) with a basic probiotic but it has been found that most probiotics for one reason or another don’t seem to be very effective towards a candida yeast problem. There are a number of reasons. First off some strains of bacteria are aggressive towards candida yeast while most are not. You mean some basically “kill” the candida yeast? Some use the word “kill” some use the word “control” but the fact is that some bacteria do seem to be more aggressive towards candida yeast than others. We know of thousands of people that have tried to control their candida yeast problem with an “off-the-shelf” probiotic that one would find at a health food store or dietary supplement retail business and have had no luck what so ever, even after spending months and months taking these probiotics. So in your opinion why aren’t most probiotics useful against candida yeast? Well look at it from this point of view. Remember that you have (under optimum conditions) literally hundreds of different strains of bacteria in your intestinal tract numbering in the trillions. So how much help do you think taking a capsule filled with 5 or 8 or 12 different strain of bacteria that number only a few billion will be to you? The answer is when it comes to a candida yeast problem not much. But in “Candida Yeast Support” you only have 3 strains of bacteria numbering less than 300 million and you say that it’s more effective than other probiotics that number in the billions, how is that possible? Like I said before, The lab that originally cultured these bacteria that are found in “Candida Yeast Support” discovered they were very aggressive towards candida yeast, much more so than most bacteria found in virtually any other product on the market. It’s like this if you hired two groups of cleaners to come in to clean your house and the first group consisted of just 3 people while the second group consisted of 12 people. The group of 3 come in and immediately gets to work, cleaning your house from top to bottom. The group of 12 come in and sits around in your living room and watch TV. Which group would you want to clean your house? OK, point well made. So it’s not how many strain of bacteria or how many total bacteria are in a probiotic but what type of bacteria they are that’s important when it comes to helping control a candida yeast problem. So I can’t assume that all probiotics are the same? Correct. Most probiotics have not been found to be anywhere near as effective for literally thousands of our customers as the bacteria found in “Candida Yeast Support”. Other than anti-fungals and probiotics what other method do people try when attempting to get their candida yeast problem under control? Diet is quite often the first thing people try and in some cases it seems to work temporarily but the strictness of most “candida” or “yeast” diets keeps people from being able to stick to them for any length of time. Are these diets that strict? Yes, they ask you to not eat virtually anything other than green vegetables, chicken and fish. All grains, dairy, and fruits are eliminated along with several cuts of meat. Make no mistake candida or yeast diets are brutal. I haven’t known a single person that has been able to stick to it for any length of time. And in many cases it doesn’t seem to change much of anything. What do you mean it doesn’t change “much of anything”? Like I said before quite often a candida yeast problem seems to be traced to one’s heredity or metabolism so the diet doesn’t have much effect. What is the term “prebiotic” and how does that figure into all this good bacteria and candida talk? Prebiotics are a type of dietary supplement that “feed” the good bacteria within your intestinal tract. Prebiotics work as sort of a “fertilizer” for the microscopic bacteria plants. The good bacteria feed and reproduce. This in itself is a very good thing because the growth of good bacteria helps keep the bad bacteria in check. Its sorta like feeding your lawn a proper fertilizer so that the grass continues to grow and keep the weeds crowded out. You sound very positive when it comes to “Prebiotics”? Yes I am. 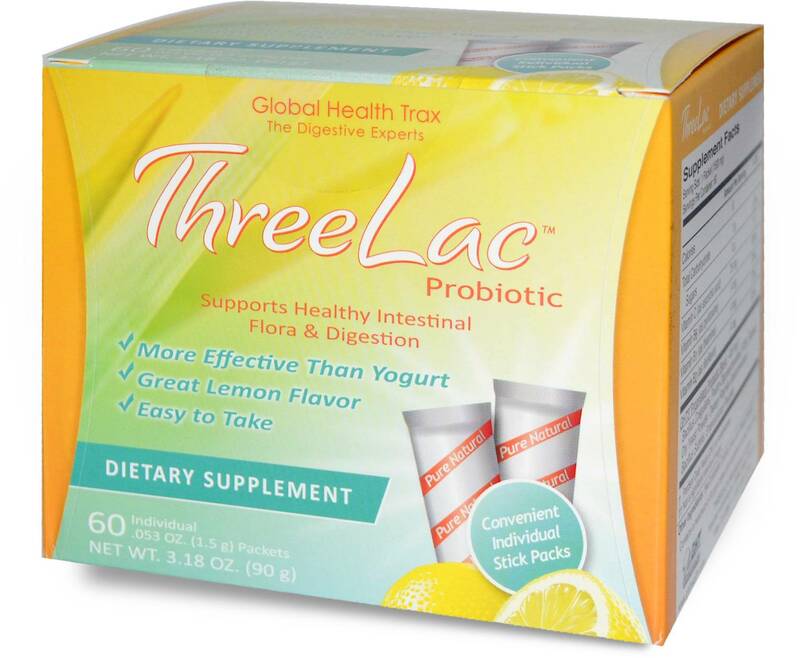 Quite frankly for just maintaining intestinal health without having a candida yeast concern I believe a prebiotic is better for you than a regular probiotic. Synbiotics are combination probiotics and prebiotics in a single capsule. In other words you’re adding good bacteria to your system and you’re getting the “fertilizer” to help your existing good bacteria grow too. Sort of a “double-edged sword”. 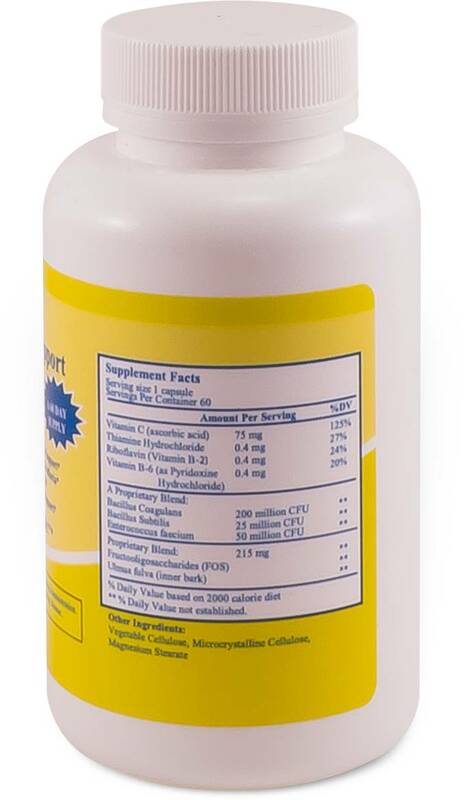 “Candida Yeast Support” is a “synbiotic,” it is both a probiotic and a prebiotic in a single capsule. It’s another good reason why this product seems to be so effective when it comes to a candida yeast problem. Can you recap for me briefly the different ways that someone can attempt to control their candida yeast problem? Again let me remind you that we have experience in dealing with thousands of people when it comes to candida yeast problems and finding relief. Antifungals, Either those prescribed by doctors or those found in an alternative health food store. They can kill both good & bad bacteria. They can leave your intestinal tract “barren” so the bad bacteria can regrow and repopulate even more fiercely than before. Antifungals are also hard on your other organs. Candida yeast seems to be able to mutate rendering the antifungal ineffective after a time. Regular probiotics. They attempt to repopulate the intestinal tract but they seem to be too few in number to make any sort of a difference. Most bacteria that come in probiotics don’t seem to be aggressive towards candida yeast either. Plus most bacteria found in probiotics aren’t protected through enterocoating so the acids of the stomach more easily destroy the live bacteria. Diet. Basically your diet is limited to green vegetables along with chicken and fish. This is designed to stop the candida yeast from being “fed”. The problem is that a diet this strict just cannot be maintained for any length of time. It’s too hard. Plus in many cases it has been found to be only slightly effective or not effective period. It is made up of strains of bacteria that seem to be highly aggressive towards candida yeast. The bacteria doesn’t just “sit” in your intestinal tract and do nothing. A “bacteria fertilizer” known as a prebiotic is combined with the live bacteria packed in the capsule, with the expressed purpose of “feeding” the good bacteria that already exists in your intestinal tract causing it to grow and reproduce which in turn helps crowd out the “bad guys”. How long does it take for someone to get their candida yeast issues under control using something like Candida Yeast Support? Typically it seems to take between one and six months. Some issues like nail fungus have been reported to take longer. How many capsules are in Candida Yeast Support and what is the recommended dosage? There are 60 capsules per bottle. A maintenance amount is one capsule per day. For someone just starting a more aggressive program would be two to as many as four capsules per day for the first 30 to 60 days. 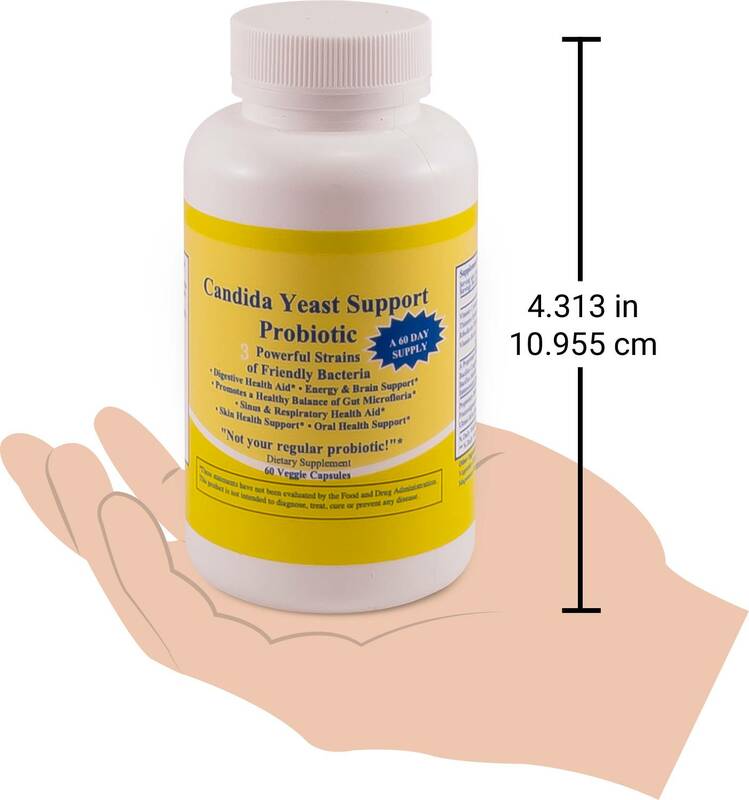 And what is the cost of Candida Yeast Support? You can find it on sale on this site for $39.95. The suggested retail price is $49.95. Does it come with any sort of money back guarantee? Yes it has a 30-day money back guarantee.